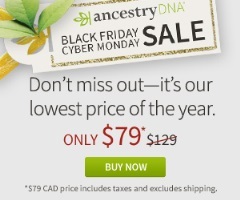 Offering a saving of CAD$50, Ancestry.ca is promoting its lowest price of the year to Canadian residents buying an Ancestry DNA test kit. Reduced from the standard price of CAD$129 to CAD$79, the price you pay includes taxes. Shipping costs are extra. The discount will end at 11:59pm on Monday 27 November.